In May 2015, the public’s perception of solar power changed overnight. What happened? Billionaire Elon Musk jumped on stage in California and announced a product called the Tesla Powerwall, a sleek-looking home battery. For people living off-grid, the concept of powering your home with a battery had been around for decades, but Musk’s gift for publicity took the concept from the off-grid fringe to the grid-connected mainstream. Overnight, solar installers were bombarded with people wanting batteries with their solar power systems. I’ll talk about the pros and cons of adding batteries to your system later. Right now, I want to quickly go over the different types of solar systems and where batteries come into the equation. Let’s go through each option briefly. This is still the most common solar system by a country mile. Ninety-five per cent of solar systems in Australia are of this type. This is a solar power system that is connected to the grid. It has no batteries connected to it. 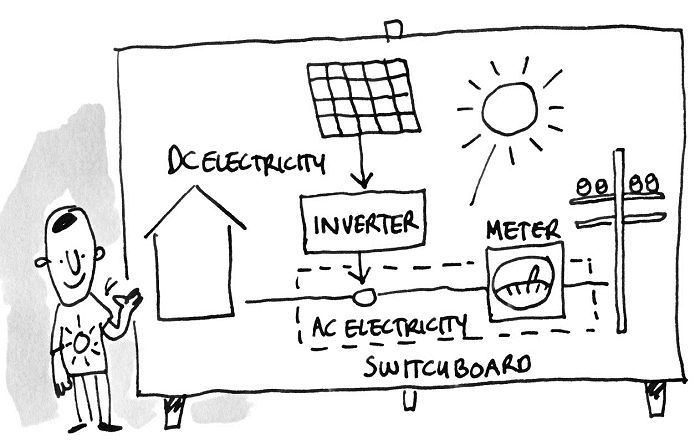 Figure 1.6 An on-grid solar system, no batteries. The solar panels generate direct-current (DC) electricity when light hits them. Remember, it is the light from the sun that generates the electricity, not the heat. Heat actually reduces the panels’ efficiency, as we’ll learn a little later. How do solar panels generate electricity from light? The light knocks electrons about in the silicon wafers that make up the panels. Those electrons are caught by tiny wires called ‘busbars’, which are laid on the silicon. This process is called the ‘photovoltaic effect’. The DC power is ‘direct current’, which means it is a steady voltage and current. This voltage can be high: up to 600 V in a residential installation. But the appliances in your home don’t use DC; they use ‘alternating current’ (AC). AC means that the current wiggles up and down 50 times a second. The reason they use AC power is that, at the advent of large-scale electricity generation, AC was much easier to generate. Why? Because all generators were made to spin. For example, a steam turbine uses steam to spin a generator. A spinning generator without any modern power electronics to smooth it naturally generates AC as it spins round. Also, AC is much easier to put through transformers to jack up the voltage to hundreds of thousands of volts. Then the current can be efficiently transmitted long distances from power stations (or wind farms) to your local substation. The whole developed world is set up for AC power, so we need to convert the DC solar power to AC power, which in Australia is 230 V AC, cycling at 50 times a second. That DC to AC conversion is done by the solar inverter. The solar inverter is a box of power electronics that sits on your wall. 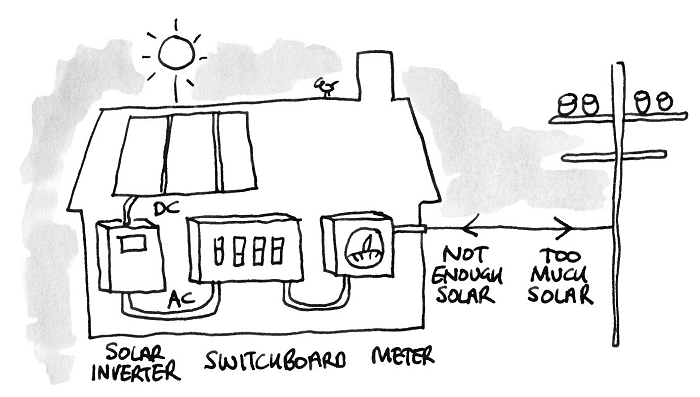 It converts solar DC to usable AC, which is fed directly into your home’s switchboard. From the switchboard the solar power will first flow into any appliances in your home that are using power. There will always be some electricity consumption in a modern home, so whenever there is solar generation, at least some of it will flow into the house. The on-grid solar system has two basic modes of operation, which depend on how much solar is being generated and how much electricity your home is using. If there is more solar energy going into your switchboard than your appliances can use at any point in time, the excess solar electricity will simply be exported to the grid. Figure 1.7 Surplus solar flows into the grid. This excess solar energy (Arrow C in Figure 1.7) flows through your meter recording how much power is flowing out. The meter counts how many kWhs go out into the grid. It keeps tally on one of the digital counters that you can scroll through on your meter’s liquid crystal display (LCD). Your electricity retailer (the company that bills you every quarter) will record this count in every billing cycle (usually every three months). If you have a ‘smart meter’, they get the number over the air. If your meter is not smart, someone comes and reads it manually. The retailer will pay you for that exported electricity. 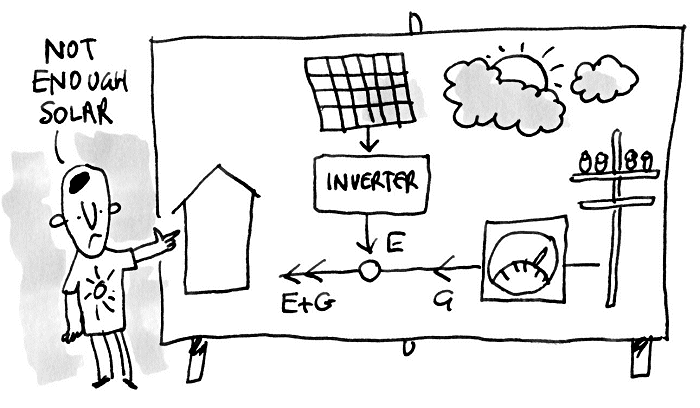 If, at any point in time, you are not generating enough solar energy for your appliances to use, your switchboard imports grid electricity to make up the shortfall, as shown in this animation and Figure 1.8. Figure 1.8 Not enough solar so electricity is imported from the grid to top it up. The energy from the grid in Figure 1.8 flows though the meter too. The meter records how much grid energy you import so you can be charged for it. 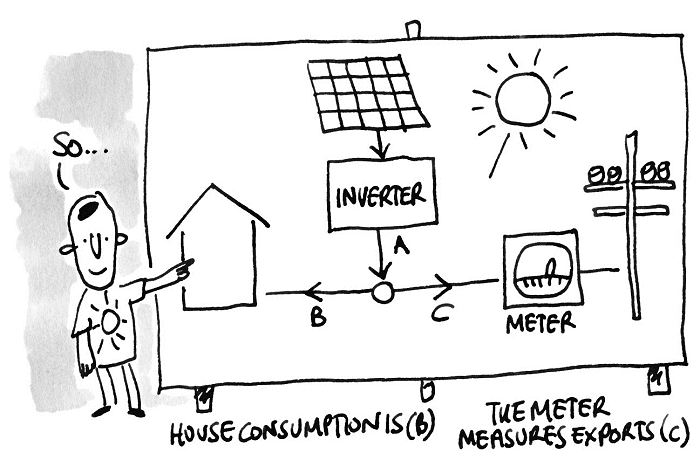 Again, the meter cannot measure your home’s total electricity consumption (which is the sum of E and G in the diagram). It can only measure your grid imports (G). 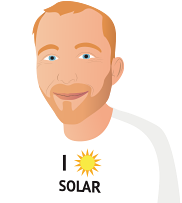 You’ll need to buy your own monitoring if you want to see what’s going on ‘behind the meter’, and I’ll show you how to do that in Step 5: A monitoring system for your solar. The concept of ‘behind the meter’ You expect your electricity meter to know how much energy you use. Sounds obvious, right? But generating your own electricity needs a whole new mindset. You may be surprised to learn that the meter installed by the electricity retailer doesn’t know – and can’t know – the details of what is happening with your home’s electricity. When you have surplus solar, your meter can’t see how much electricity your home is using or how much is being generated by the solar system. It can only measure the exported solar. For example, if you’re exporting 2 kW of surplus solar your meter doesn’t know if you’re generating 3 kW and using 1 kW, or if you’re generating 4.3 kW and using 2.3 kW. All it knows is that the difference is 2 kW. Figure 1.9 shows the physical layout of a grid-connect system.